It really is so cute to see our baby chick’s reaction to Sun Yu’s bare headed look. Of course, her sweet and happy smile help as well. He’s absolutely smitten with her. Yep, yep. He’s totally in a daze until she calls his name and asks what he’s doing there. Does he need her for something? Um…no. He walks away and goes to the woods. He turns back in the direction of Sun Yu and wonders just what he’s reacting like that towards his nun. Sun Yu recalls Tae Jung’s words from the night before and she starts thinking again. The first thing she does is head to her sister’s restaurant. There she finds out that Jin Yu quit several months ago. The worker there is surprised that Jin Yu (who isn’t one to lie) lied about a branch opening in China. Is it possible that Jin Yu is working at a different restaurant? Maybe. The worker then says that if Jin Yu had been married, she would have suspected her of being pregnant as the smell of food would make her very sick. Need you any more proof that Jin Yu is in Korea and pregnant? So what does our concerned lil sis do? She hightails it to the hospital where she thought she saw Jin Yu. The nurse doesn’t want to give out any information, but Sun Yu pleads with her. The director of the hospital there is great supporters of the convent. Out comes Jin Yu’s doctor. Since Sun Yu is her sister and the doctor is very concerned about Jin Yu, she agrees to give Sun Yu Jin Yu’s personal information (or rather, updates her on Jin Yu’s worrisome health issues regarding the pregnancy). While Sun Yu is searching desperately for Jin Yu, Ji Suk is searching desperately for someone, too. He goes to a farm where he finds an old grandfather. He calls out to the man and asks if he remembers him. The man does and calls him “young master” before quickly shutting his mouth and running off insisting he doesn’t know who Ji Suk is. Looks like this old man might have a connection to Ji Suk before he moved into the Seo household. 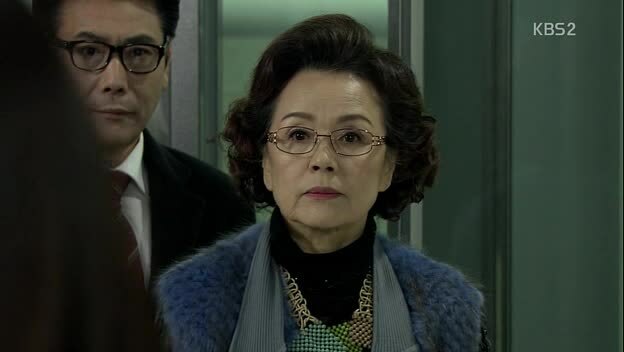 The old man calls up Jung Soon and she’s not happy to hear her grandson is in search of his birth mother. She tells the grandpa to run away and she will compensate him however he would like. Poor Ji Suk. Is his mother really all that bad? Sun Yu is going around looking for her sister. She finally runs into Jin Yu on the street. As soon a she sees her eonni, Sun Yu can’t help but cry. They go back to Jin Yu’s place and Jin Yu explains everything and how she is going to have this baby (which is a girl that she calls Sarang) on her own and will make sure to go do her regular checkups at the hospital. Sun Yu is very upset that her sister is going it alone—especially when the baby’s father is alive and well. Jin Yu shows off her rosary bracelet that Sun Yu made and replies that her baby sister is always by her side. Awww. Such a lovely sibling relationship. Meanwhile, Tae Mi and Dal Nyeo have ignored Tae Jung and come to the company. They insist on meeting Ji Hee, but when they aren’t allowed in, they try to get in using Tae Jung’s name. Security comes as does Ji Hee. She introduces herself and Dal Nyeo scolds her for saying Tae Jung’s name more informally (she calls him Tae Jung-ssi instead of using his last name or his title) until she learns Ji Hee is his girlfriend. The woman then takes the two out for lunch and it’s quite disgusting how Dal Nyeo praises Ji Hee for being rich and her son doing very well right in front of her future daughter-in-law. Tsk, tsk. She does make a slipup and says both her daughter-in-laws are good to her. She then has to back peddle and say she is talking about her nephew’s wife. Right. Back at Jin Yu’s place, she has made a very sparse dinner. Sun Yu is worried over the fact that Jin Yu isn’t eating well at all. She goes off into the kitchen and tears up as she sees the meager contents of the fridge. She then recalls when she had cancer (leukemia I think). Everyone had given up on her and the mere smell of food made her sick. Jin Yu wouldn’t give up on her and made her a special bowl of mixed rice. Thus Sun Yu repeats the kindness and makes mixed rice for her sister. While this warm and tearful scene is going on Ji Suk sits cold and alone trying to find where the grandfather disappeared to so quickly. Ji Hee is headed out of the company arm in arm with Tae Jung and her grandmother sees this and Jung Soon is NOT happy whatsoever. Even if Tae Jung is a good employee, he is not husband material for her granddaughter. Tae Jung is worried about their relationship being revealed like this with the chairwoman, but Ji Hee tries to assure him that everything will be all right. Later at the Seo home, Jung Soon tells Aran that she has arranged a match with another family for Ji Hee. Aran is livid. That is the only son of a smaller company…that means they’d lose Ji Hee. Aran tells of her own plans, but Jung Soon already knows the truth about the foiled arranged date. Aran doesn’t care. She will take care of the Tae Jung problem no matter what and arrange her own daughter’s marriage. Jung Soon reminds Aran that she also has a son and we have Woo Hyun cutely going off on his sister-in-law about how she always ignores Ji Suk. 1 + 1 = 2 you know! So precious! But we all know that Aran doesn’t give a rat’s rear for the son of her husband’s mistress who is betraying Jung Soon by searching for his birth mother. The livid Aran then rushes out of the room and immediately yells at Ji Hee for the troubles she is causing. Sun Yu and Jin Yu sadly part ways. Sun Yu is worrying about leaving her eonni alone and pregnant. Jin Yu tells her to take a picture. Jin Yu poses and asks if she still looks pretty. The teary eyed Sun Yu replies yes, but Sarang is even prettier. The two hug and part ways. On the bus ride home, Sun Yu hesitates but decides to contact Tae Jung who is in an important meeting to save the deal Ji Suk ruined by rushing home to Korea. He ignores her text until he sees the picture of the very pregnant Jin Yu. Put that in your social climbing pipe and smoke it. Jacky. He rushes to meet with Sun Yu who insists that he take responsibility for the baby. Tae Jung insists the child isn’t is and we all know that isn’t true. Sun Yu again urges him to do right by Jin Yu. Tae Jung does promise to meet her, but you know nothing good will come of this meeting. At the same time, Aran learns of the rumor that Tae Jung was living with a woman before dating Ji Hee. She doesn’t like this news at all and sets out to find out what she can about his lover. Episode 5 starts with Mr. Angry Pants rushing to Jin Yu’s apartment. He is livid that she went back on her word to get rid of the child. Jin Yu replies that the baby is hers not his. She will have this child and raise it on her own. Needless to say, Tae Jung doesn’t think all that highly of his ex- girlfriend. He believes she was going to quietly have this baby to chain him to her or destroy his perfect life later. How could she love such a narcissistic and unreasonable man? After a brief pause in fighting due to overwhelming emotions, the arguing starts again between Tae Jung and Jin Yu. It’s at this time the Heos arrive as Sun Yu had called them and told them to look after the pregnant and alone Jin Yu. Poong Ho is livid that Tae Jung is insisting on shirking his responsibility as a parent. Tae Jung makes his angry escape as Jin Yu has more pains as she tries to stop her uncle from beating him. He gets outside where he angrily screams and beats his car. Eyeroll. At this time, Aran calls Tae Jung and arranges to meet with him. Ji Hee sees her mother leaving and is surprised that Aran was at the company at all. She hits her mom’s assistant up for information and is not a happy camper. Anywho, as soon as Tae Jung meets with Aran, he gets a face full of water. He deserves worse than that. But I’m not happy about this light punishment since we all know Aran isn’t really all that much better as she doesn’t care about Ji Hee’s feelings, just her daughter marrying well. So she upbraids him for his parentage and his audacity of dating another woman (okay, not that, but rather living with a woman) before going with Ji Hee. Tae Jung is honest and says that he did date someone and that Ji Hee already knew that. Ji Hee comes in and this makes Aran even angrier. He was supposed to come alone but he brought her daughter? Ji Hee insists that she found out through other means just like her mother is able to. She also says she knows about his past and that Tae Jung had broken things off with his previous girlfriend before they even started dating. Aran is definitely not happy that Ji Hee is fine with Tae Jung’s past or his parentage. The Heos are trying to convince their niece to come back to their home so they can take care of her. Jin Yu stubbornly refuses as she is helping take care of a restaurant here. Bong Hwang cannot believe that Jin Yu in her delicate condition can even work at all. Jin Yu keeps insisting that she is fine, but we all know that isn’t really true. Poor Poong Ho feels like he’s really failed his niece and starts crying which makes Jin Yu and her aunt tear up as well. Bong Hwang is very upset about Tae Jung and Jin Yu insist that she doesn’t hate him. Tch. He’s proven himself to be quite contemptible. Back at the convent, Ji Suk is worked up about not finding the grandfather. To relieve his frustrations, he jumps, does pushups and gets himself all hot and bothered. He starts taking off his clothes when Sun Yu enters. This freaks him out and he yells at her for not knocking first. Sun Yu averts her gaze and apologizes. She then asks why he’s sweating so much. He says maybe the floor is too hot. She checks the floor, but its fine. She touches his ankle and that’s not hot either. Odd. While she checks on his bandage, he asks where she’s been all night. Does she have a problem? He’s willing to listen. Aww. Sun Yu assures him that she is fine. When Ji Suk complains about the herbal remedies she gives him, she tells him not to worry as she has studied natural medicine in preparation to do missionary work abroad. Seeing her expression light up as she talks, really hits Ji Suk. He then asks why she chose to become a nun. Sun Yu talks about the cancer, giving up on life, and her prayer to be saved. When the miracle occurred, she promised to do anything for the person who saved her. Ji Suk is really touched by this. He has no idea what to do about his life. Sun Yu replies that when he is at his most desperate, he will find the answer he seeks. Ahh, these two are so perfect for each other. Dal Nyeo is hosting a goodbye party as she is closing up shop like Tae Jung wishes. She’s bragging about becoming Ji Hee’s mother-in-law when Aran shows up. 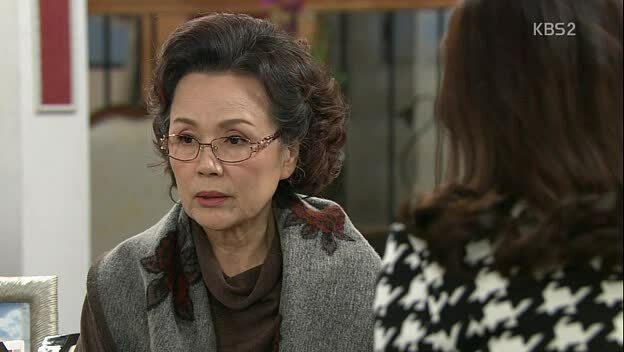 At first Dal Nyeo thinks she is a customer’s wife coming to beat her, but is shocked to learn it is Ji Hee’s mother. Aran asks after Jin Yu, but Dal Nyeo insists that she really doesn’t know where Tae Jung’s ex is at the moment. Even if she did, she won’t help Aran. The evil rich mom then gives an envelope to the evil poor mom. This money is to ensure they stay out of her family’s life. Dal Nyeo is livid and tries to refuse, but Aran just walks away. I really doubt, even if she is offended, that Dal Nyeo will give up that much money. At the same time, Tae Jung is dropping Ji Hee off at the Seo house. Once inside, Jung Soon greets her granddaughter. Ji Hee asks her to look past Tae Jung’s roots and look at what really matters—his personality and work ethic. Jung Soon says she wishes her granddaughter would understand. She does not discriminate in background when she’s hiring—it’s all dependent on capabilities, but when it comes to marriage and her granddaughter, that is not enough. At least…I don’t think she’s quite as bad as Aran. She can’t be because it does seem that Ji Suk genuinely likes his grandmother and uncle…just not his stepmom (and possibly his sister, who knows?). Bad feeling vibes. Tae Jung is worried about the truth coming out. Aran has already found out he used to live with Jin Yu…what happens if she finds out Jin Yu is pregnant with his child? Since Aran had a son brought into her (happy) marriage, you know she wouldn’t want the same thing to happen to her daughter. Ji Suk goes out for air the next day and complains about how he completely smells like the fermenting beans now. He spies Sun Yu sweeping the yard and smiles. He walks directly into her path. She asks him to move (after he complains about her not seeing him), but he refuses. Thus Sun Yu keeps sweeping at his feet, making him hope around on his good ankle. Ji Suk complains about her temperament and she naps this is why she is a nun in training. LOL. While these two things have nothing in common, I’ve been thinking of Julie Andrews’s Maria from The Sound of Music. Anywho, she then tells him to go to mass, because you never know his prayer might be answered and his compass found. Sun Yu goes to her room and gets a call from her uncle. Sun Yu asks if he’s with Jin Yu. Poong Ho says he’s with the girl and then complains about Tae Jung not being a human. Jin Yu scolds him and tells him not to make Sun Yu worry. Poong Ho then says they will take care of her sister. Sun Yu tears up and hangs up. She then goes out into the woods to dig for the compass. Ji Suk finds her there—just where he thought she’d be. He feels badly for not telling her sooner. He then picks up two sticks and tells Sun Yu that they are like divining rods and will point him to the compass’s location. Sun Yu gets up. She is hesitant to believe in his story, but Ji Suk continues on and says that he got a signal. He tells her its at a specific tree and this excites Sun Yu. She digs, but no compass. This freaks Ji Suk out. He was sure he buried it at that tree. When he can’t find it, he wonders if it’s the tree next to it. He goes and digs up that one and finds it. He’s happy that he didn’t really lose the compass, but is shocked to stand up and find Sun Yu crying. She talks about how she worriedly looked for the item thinking about him and his mother (and her special person). How could he do something like that? Ji Suk tells her to wait and here him out. He didn’t mean to play a trick on her. He explains how he found the compass in her room and took it back. He really didn’t mean to keep the truth from her like that. Of course, Sun Yu still isn’t happy with him. You can’t 100% blame her for that. Ji Suk chases after Sun Yu only to be brought to halt by a dog. It growls at him and he falls to the ground. He recalls a scene from his past where Aran cornered him with a giant dog. Poor boy. No wonder his personality is slightly bent (but not as twisted as some guys’ we’ve seen in dramas of late). Sun Yu turns at his yell and sees him frozen in fear on the ground. She comes up to him, crossness forgotten and tells him it’s okay and to get up. As soon as he gets to his feet, the dog barks and lunges. I foresee these two joining hands against Tae Jung. I highly doubt Ji Suk will like his future brother-in-law (since the previews show Ji Suk seeing Sun Yu begging Tae Jung). Plus, who knows just what Aran (or Ji Hee) will end up pulling down the road?